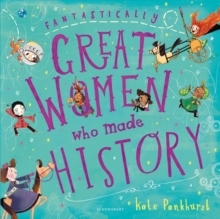 Fantastically Great Women Who Made History is the eagerly anticipated follow up to Kate Pankhurst's hugely successful, Fantastically Great Women Who Changed the World, number one best-selling children's non-fiction title. This beautiful title looks at the stories, accomplishments and adventures of many more brilliant women from throughout history. Travel through the Underground Railroad with the brave and courageous Harriet Tubman, turn the pages of the hauntingly brilliant Frankenstein with the incredibly talented Mary Shelley and prepare yourself for an unforgettable journey through history with these and many other remarkable women. Overflowing with vibrant and beautiful illustrations, and wonderfully engaging text, Fantastically Great Women Who Made History is a celebration of just some of the inspirational women who put their mark on the world we live in.